This 8 hour Photography Certificate Course was designed for the serious amateur photographers that have the desire to experience the ultimate photography course. 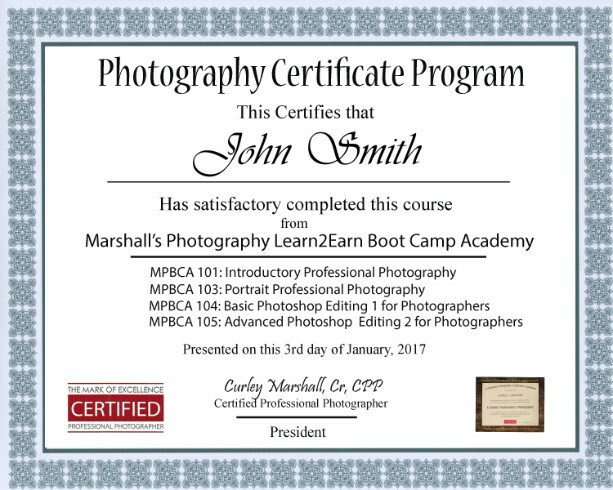 This is a four course photography class with private (one-on-one) instructions to help you achieve your goals to become a better photographer. At the completion of this four level course, you will earn a photography certificate. This course may be taken over a course of days or weeks. • Your 8 hours may be used on one class or divided between other classes offered. The Introductory Class will help you master your camera. You'll learn the ins and outs of camera settings, aperture, shutter speeds, ISO, composition and depth of field. Once you learn how to take control of your camera, you can, with confidence, apply your new found skills to everyday shooting. Then you will understand all those mysterious buttons. This class will help to take your photography to the next level. The Portrait Photography Class covers the use of Lights, Camera and Posing. In this class you will learn about studio lighting, lighting ratios, Soft boxes, Posing and utilizing loop lighting, narrow/short and broad lighting to shape the subject face. These types of lighting techniques add an element of dimension to your portrait. You can master the light, but you must first learn to see the light. There are three main keys to understanding lighting. They are light placement, the direction of light, and the quality of that light. When you understand how to control your lights, you will get the desired effect. Learning to see the light will take your photography to the next level. The Photoshop Editing 1 and 2 for Photographers. This is one of our most popular course. The Photoshop class was designed for photographers who want to learn how to edit their Images. This class is divided into two parts, basic and advance. In the basic class, you’ll learn about Tool and Techniques • Work Flow • Sizing and Cropping Images • Basic Layers • Creating a Brush Logo • Brighten and Darken Images • Color Tinting • Removing Red Eye Color Corrections and much more. Part two is more advanced covering Removing blemishes • Applying Make Up • Softening Skin • Moving heads• Removing backgrounds and much more. This 8 hour course is "Power Packed" to take your photography to the net level. After Purchasing you must call to Schedule a start date.